Chicago Tribune columnist Rex Huppke made the case for kindness in the workplace at Quinlan's March 11 Signature Series event. Kindness in the workplace is more pleasant and has a greater return for businesses' bottom line, said Chicago Tribune columnist Rex Huppke, at a Quinlan Signature Series event on March 11. Nearly 125 Quinlan students, alumni, and human resource professionals attended the event held in Quinlan's Wintrust Hall. In addition to Huppke, the event featured the annual Institute of Human Resources and Employment Relations award ceremony. Devon Byrne, Director of Global Employee Relations, Gap Inc. 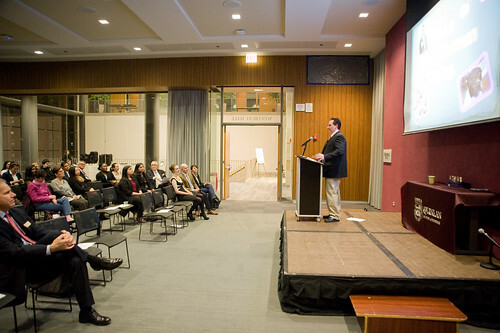 The event was sponsored by Loyola’s Institute of Human Resources and Employment Relations.